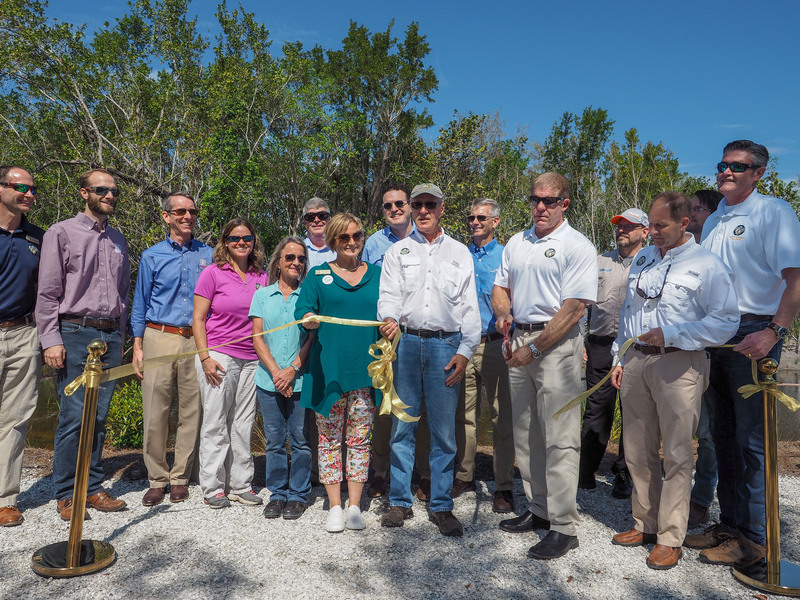 The City of Sanibel held a ribbon cutting for its Jordan Marsh Water Quality Treatment Park on Friday, March 1. City Manager Judie Zimomra welcomed the attendees and was followed by speakers Mayor Kevin Ruane, SCCF CEO Ryan Orgera, Vice Mayor Mick Denham and City Councilmembers Chauncey Goss, Jason Maughan and Holly D. Smith. The footprint of the Jordan Marsh includes six acres of City land plus a 1.3-acre portion of SCCF’s conservation land known as the Andrea Waitt Carlton Family Tract on the Bob Wigley Preserve. The SCCF Marine Laboratory began working with the City of Sanibel on water quality in Sanibel’s interior wetlands over four years ago, identifying major sources of nutrient pollution (nitrogen and phosphorus). The Lab developed Sanibel’s Comprehensive Nutrient Management Plan, which formed the scientific basis for the City’s moving ahead and establishing the Jordan Marsh Water Quality Treatment Park. The City’s primary goal is to improve water quality in the Sanibel Slough and to help meet Florida water quality standards. Secondary goals of the project are to enhance existing wildlife habitat on the site, provide recreational opportunities, and educate park visitors on the various Best Management Practices (BMPs) used to improve water quality. The project is being funded in part by the South Florida Water Management District Cooperative Funding Program, Lee County Community Park Impact Fees and City budgeted funds. SCCF’s Marine Laboratory scientists will be monitoring flow data in the Marsh, and will continue to collect and monitor water samples to measure the results. The Lab will issue a report in September 2019.